For two weeks we hosted a group of 14 high-schoolers and secondary school students (15 -18 years) at our Fab Lab in Oulu. The training started on 06.06.2016 and finished on 17.06.2016. Our intention was to study what kind of activities we could prepare in the future in our Fab Lab for youngster between 14 and 18 years old. All the experience is documented in a blog that I wrote during the training . We set a goal for the summer trainees the first day: they had to build an "alarm-bot" from scratch (including electronics, mechanics and programming). The only requirement was that the robot had to move, make noise and turn lights on/off after certain amount of time. During the two week training the participants got acquainted with Fab Lab concept, machines and tools. They also learnt how to create an Arduino shield from scratch (using our milling machine), how to use a 3D printer and a laser cutter to create the mechanics for an electronic device, as well as Arduino programming principles. The experience was very rewarding both for the trainees and for us. All groups managed to meet the initial requirements. This is a great achievement considering the limited amount of time and the lack of experience of the trainees in the fields of electronics, 3D design or microcontroller programming. "In our opinion FabLab should offer more opportunities like this for students our age, because we haven’t had possibilities before to do programming or make circuit boards in school or anywhere else." 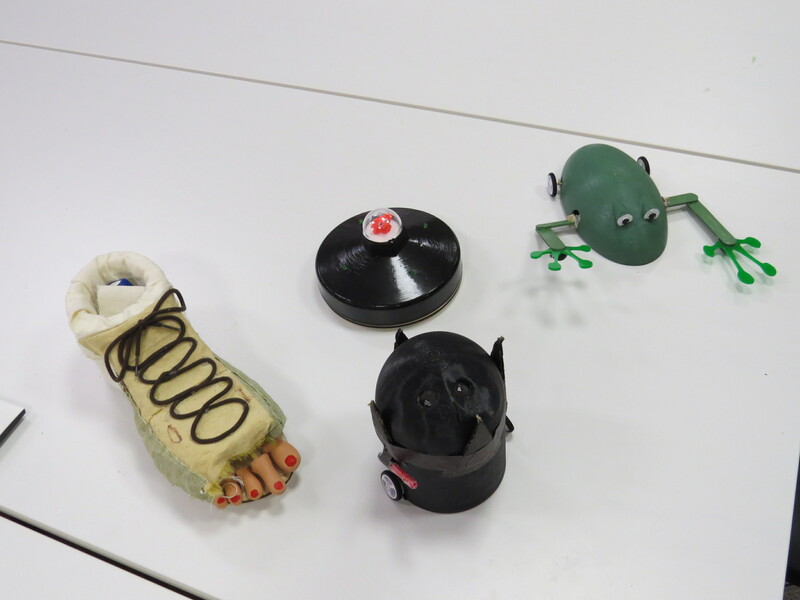 "We all liked prototyping the robot and also 3D-modelling. Prototyping is an art where your imagination really flies and a great group activity. You get to know the other people in the team by doing things together." "The pros of the training were that the whole concept itself is really interesting and it can encourage youngsters to be more interested in, and understand better what’s going on inside their smart phones. Also, most of us didn’t have much previous experience on this subject so we all agree that we learnt a lot; not just about technology but also about team-work and working more independently without the constant guidance of an adult." "The whole training was extremely comprehensive and we’re sure we will be able to benefit from the learnt skills in the future and that’s something we’d like others to experience too. It’d be nice to see similar courses in Fablab."